House Republicans negotiating an immigration bill struck a deal Tuesday evening that sets up a vote on two immigration bills next week, House Speaker Paul Ryan's spokeswoman announced. "Members across the Republican Conference have negotiated directly and in good faith with each other for several weeks, and as a result, the House will consider two bills next week that will avert the discharge petition and resolve the border security and immigration issues," the spokeswoman, AshLee Strong, said. The full House Republican conference will meet Wednesday morning to discuss the bills. The agreement came together as an attempt to head off an effort by moderate Republicans to force votes on four separate immigration bills on June 25. Tuesday evening was the deadline by which they had to gather the necessary 218 signatures for the procedural measure, called a discharge petition. The discharge petition ultimately received 216 signatures. Rep. Henry Cuellar, D-TX, the lone Democrat who was withholding support, signed the petition Tuesday evening. Rep. Carlos Curbelo, one of the moderates behind the discharge petition, hailed the news as a "major development but urged fellow Republicans and Democrats to keep their names on the discharge petition until they verify what is in the proposed legislation. "While we believe all parties have negotiated in good faith, until and unless we confirm the proposed legislation fully addresses the interests and concerns that unite us we must and will keep up the pressure," he said in a statement. "Members of the House –– from both parties – have demanded action, and this legislative tool has been the driving force and impetus for these negotiations and any possible vote or agreement that could result in House action on immigration for the first time in nearly a decade." Curbelo told reporters that Ryan agreed to keep the floor open for those members while negotiations continued. The moderates behind the discharge petition met separately from the conservative House Freedom Caucus members to see if they could hammer out the last few obstacles to a deal. Curbelo said that in addition to the outstanding substantive issues, the two sides were debating procedural questions around bringing a deal to the floor. Rep. Dan Newhouse, R-Washington, was considering signing onto the discharge petition but said in a statement Tuesday evening that he decided not to because Ryan assured him that the House would hold a vote on an immigration bill that would "give certainty to DACA beneficiaries and secure our border." "The DACA beneficiaries with whom I have spoken in Central Washington are not asking for a symbolic vote on measures that have no chance at becoming law. For me, reaching a long-term solution is vital for DACA beneficiaries. 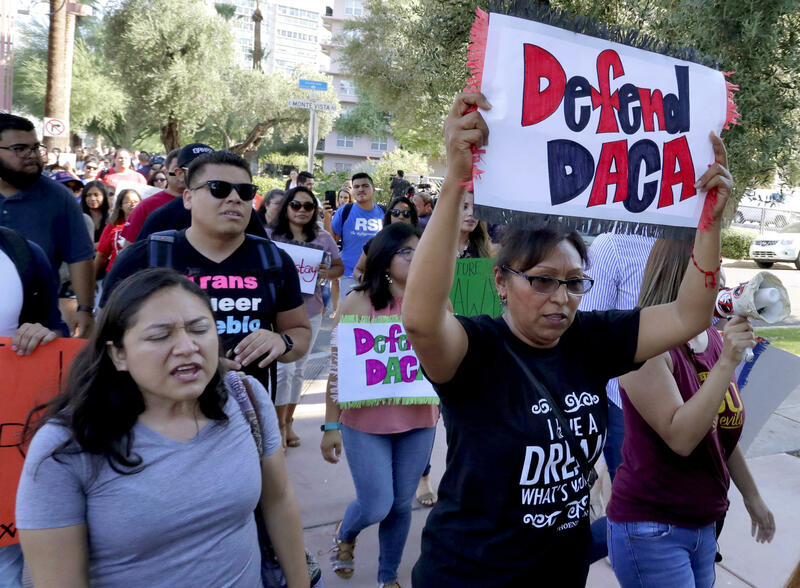 These DACA beneficiaries have asked me for certainty, and I strongly believe this may be the best legislative vehicle," he said. Newhouse added that he received a personal commitment from Ryan and Majority Leader Kevin McCarthy to bring forward a separate immigration bill to deal with immigrant agricultural workers before the August recess.